Currys is promoting Deco E4(2-pack) at £79.99. Amazon is at £99.99 without stock. Say goodbye to WiFi dead spots and make sure you always have the best internet connection throughout your home with the TP-Link Deco E4 Whole Home WiFi System. Whatever the size or layout of your home Deco‌ Whole Home WiFi gives internet access to up to 2,800 square feet without any loss of signal. It can also support up to 100 devices. That's all the phones, tablets, laptops, consoles and smart TVs you could want. And as you move around the house, your phone, tablet or laptop will automatically join the best connection without you having to sign in multiple times or switch networks. It's also really easy to set up - just download the app and you'll be guided through setup. The Deco E4 also works as a router, access point or range extender, so you get even more ways to improve your Internet experience. And with parental control options you can make sure your kids aren't stumbling across anything they shouldn't be seeing when they're going online. looks pretty good...wonder why the cold votes. trying to decide whether to get this or the power line one that's on offer at amazon today...what's the key difference between mesh and the powerline extenders? looks pretty good...wonder why the cold votes. trying to decide whether to …looks pretty good...wonder why the cold votes. trying to decide whether to get this or the power line one that's on offer at amazon today...what's the key difference between mesh and the powerline extenders? WiFi. Get these they are good, I can only assume cold votes from people who have no idea what they are. WiFi. Get these they are good, I can only assume cold votes from people …WiFi. Get these they are good, I can only assume cold votes from people who have no idea what they are. What's weird is the three pack of these went hot at £130...this seems like a much better deal. 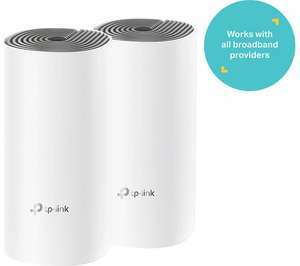 these are WiFi too …these are WiFi too https://www.hotukdeals.com/deals/tp-link-tl-wpa7510kit-dual-band-gigabit-ac750-powerline-4999-amazon-3214929What's weird is the three pack of these went hot at £130...this seems like a much better deal. Ah yes I see what you’re looking at. Not had experience of that type personally but reviews look positive. We have deco m5 system in our house it it works very well. We have an old house with solid walls and the virgin hub was poor, some rooms had no signal at all. Now resolved to a point we can stream Netflix in all rooms without buffering. These are the Deco E4 model, the 3 pack was the M4. Admittedly only minor differences between the two, but the main one being the E4 only has 10/100Mbps WAN/LAN ports compared to Gigabit ports on the M4. I'd vote cold as Argos frequently has the M4 at £99.99 (£130 just now), if you can hold off then I'd say the extra bandwidth is worth it for £10 more. Having said that, most folk will never use the ethernet ports so really up to you how important that is. Ah yes I see what you’re looking at. Not had experience of that type p …Ah yes I see what you’re looking at. Not had experience of that type personally but reviews look positive. We have deco m5 system in our house it it works very well. We have an old house with solid walls and the virgin hub was poor, some rooms had no signal at all. Now resolved to a point we can stream Netflix in all rooms without buffering.